You know how in every office there's always one person who just looks amazing every day, no matter what? For us, that person is Lara von Linsowe-Wilson, our in-house fashionista and influencer in her own right. As someone with -ahem- limited fashion sense, I must say, Lara, I marvel at your ways. Fortunately, her desk is right next to mine, so it was pretty easy to sit her down for a chat and get some insight on her fashion philosophy. In college, I managed a resale store -- which meant I always had access to the most unique clothing and accessories that students from all over would bring in to sell. I’d always loved resale stores because A) they’re cheap, and B) you always find the most interesting things there. My friends would always ask where I got certain items that I wore out or that I posted on my Instagram, and because of that, I eventually started my own blog laravlw.com to chronicle my outfits -- and thus, an obsession was born! How do you describe your personal style? Your Instagram aesthetic? My style and Instagram aesthetic are always changing (it’s all about that #feed, amirite? ), but I’d say it’s currently a mix of blogger-chic and NYC edge. I usually buy items that I love, regardless of what “genre” of style they fit into -- and then create my own looks based on what I’m feeling each day. I’m a firm believer that a good outfit can make or break your mood, so I love dressing for the vibes I want to feel and emit that day. Tell me about something that inspires you- a song, a person, an image. I’m inspired by the City! It sounds cliché, but there’s something about the bright lights, the noise, the people, and the energy here that inspire me each and every day. I’ve known I wanted to live here since I was in college, and even though I’ve now lived here for two years, it continues to inspire and influence my style, my goals, and my creativity every day. My fave place in NYC would have to be SoHo because it has all of the best views, restaurants and shopping all in one place. At what point did you make the transition from influencer to agency? What was this transition like? 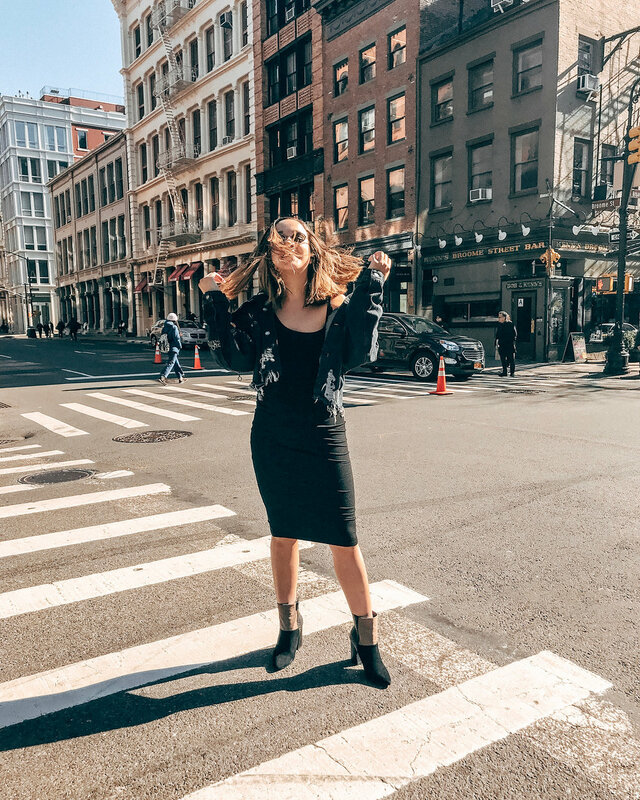 Two weeks after I graduated college, I moved to the city for an Integrated Marketing internship at a YouTube-focused influencer agency. Because I was so familiar with the space being an influencer myself, I definitely had a leg-up on understanding the role -- which led to a full-time position shortly thereafter! I still dabble in being an influencer when I have the time, and it’s been super helpful to understand how both sides of the transaction works between brands and influencers. What insights has working on both sides of the influencer game brought you? Any advice you can give to other influencers? I think the most important thing to remember is that while not all collaborations will be paid, each and every one is a learning experience that could lead the way to a plethora of larger opportunities in the future. And while it may be frustrating at times, it really is true that not all brands have budgets for influencer marketing; some of the biggest, most amazing brands are still new to the game so they don’t have budgets set aside quite yet, but that doesn’t mean they won’t be amazing to work with! This a great piece of advice for influencers to keep in mind. Here at Obviously, we will always be transparent about budgets and rewards so you can make the best decisions about which projects are a good fit.